What a difference a year makes. The Bruins looked like a whole new team last week against Rice, but no one paid any mind to it, because it was assumed that Rice sucked badly. 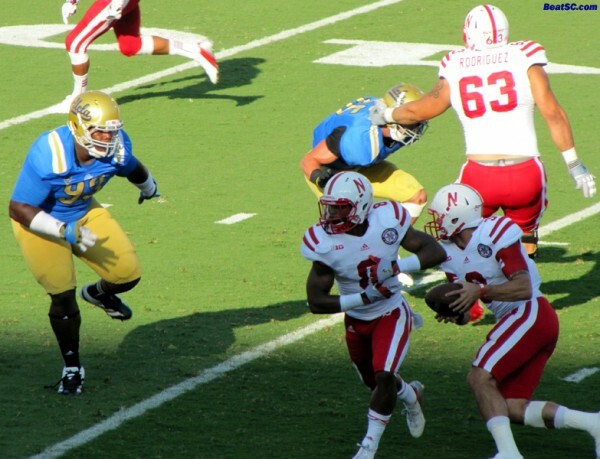 Then on Saturday, the 2012 Bruins looked new and improved again, but this time it was against the ranked perennial powerhouse Nebraska, and now, people will have to start taking notice. 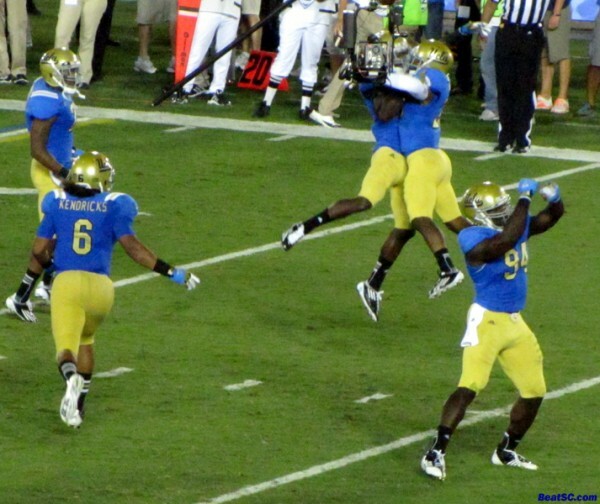 Everything is upgraded on this UCLA Team, starting first and foremost, with the Coaching. 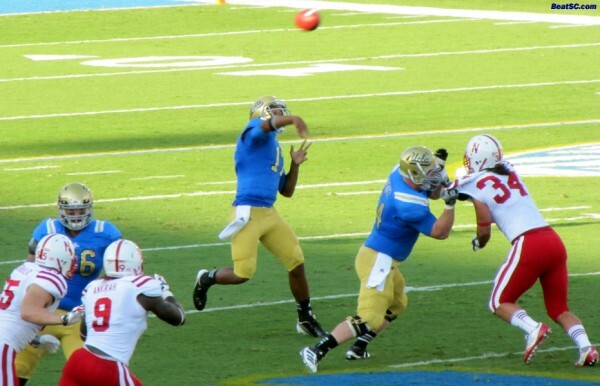 Jim Mora and staff are vastly superior to their predecessors, and it shows all over the field. 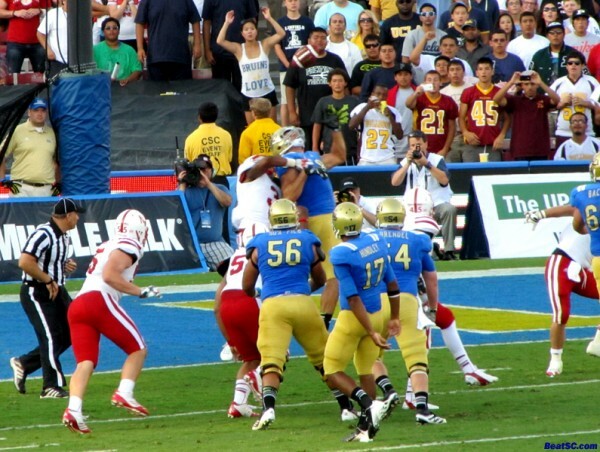 The techniques are better, the attitude is tougher, and the playcalling on both sides of the ball are effective, innovative, and exciting. 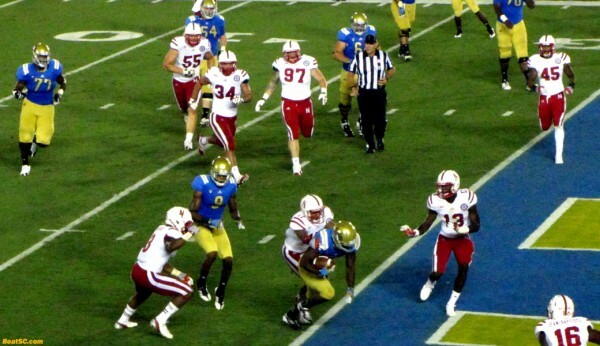 The Bruins are now passing to speedy backs, like on a Brett Hundley 49-yard TD strike to Steven Manfro, and an 8-yard TD Swing Pass to Jonathan Franklin, the latter of which put the Huskers away, by giving the Bruins a 9-point lead with 2:13 to go in the game. The old regime probably would have been more conservative in that situation. 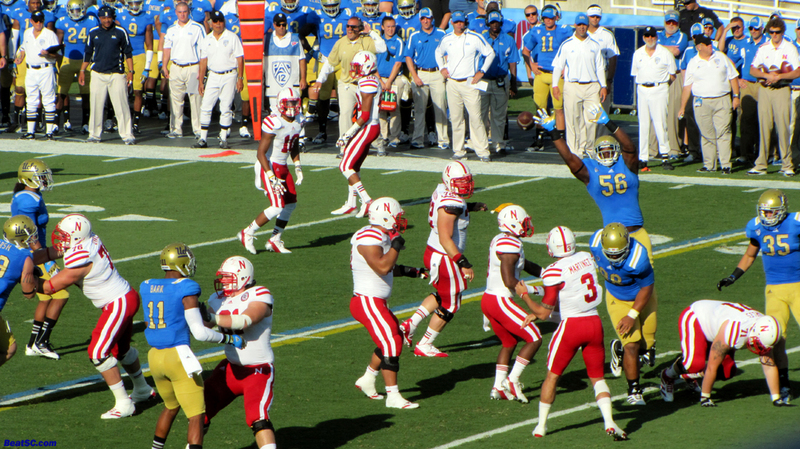 Mora also called a fake Field Goal pass attempt on 4th Down. It didn’t work, but it shows that this staff has balls. In fact, an attitude of ballsiness has permeated the whole team. While featuring the Running Backs in the Passing Game, Mora and Offensive Coordinator extraordinaire Noel Mazzone haven’t forgotten about special weapon Joseph Fauria. The 6’8″ Tight End caught two TD passes against Nebraska, and almost snagged a 3rd. And pass-happy Mazzone has not forgotten about the Running ability of Jonathan Franklin either. Franklin broke the 200-yard mark for the second week in a row, amssing 217 yards on the ground on Saturday night. While Franklin put up Heisman-worthy numbers, QB Hundley was just as impressive. Hundley ran the Offense with ease, confidence, and command, constantly directing his teammates into proper position, and correctly reading the Defense to make the right call, including FOUR TD Passes. The one problem against Rice was 3rd Down conversions, and Hundley fixed that in Week 2, going 9-20, while Nebraska went 1-11, thanks to the stellar Bruin Defense, especially after Coordinator Lou Spanos instituted his Halftime adjustments. It was 24-24 at the Break, so that means that Nebraska managed only two Field Goals in the Second Half. 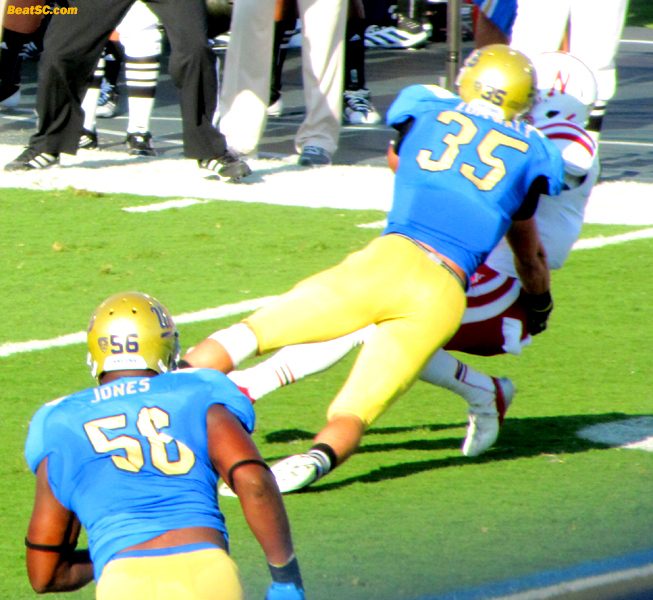 The Defense had several stand-outs in this game: Jordan Zumwalt flattened several Huskers, showing the World that the Bruins are no longer “soft.” Datone Jones, finally living up to his billing, got a couple of big Sacks, including the Safety that gave UCLA a 29-27 lead with 8:44 left. Linebacker Anthony Barr continued his rampage of speed rush blitzes and jarring hits, while Tevin McDonald also came up with big plays, good coverage, and hard hits. 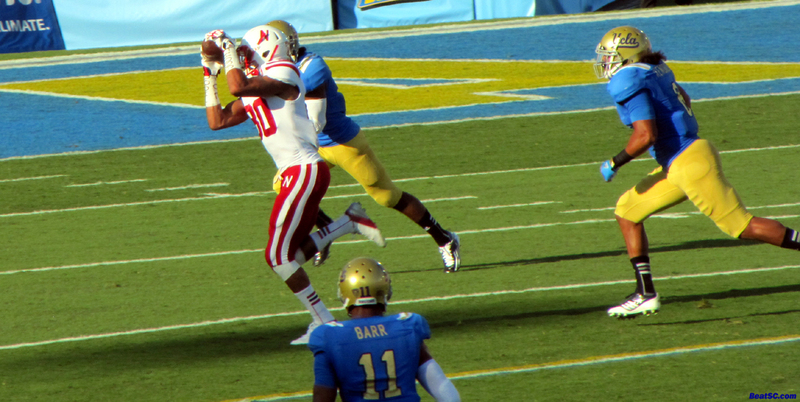 Freshman D-Back Randall Goforth was in the right place several times to break up passes (a couple of which he should have Intercepted), and Andrew Abbott was also instrumental, and he actually held on to a Nebraska pass, for an INT that put UCLA in position for Franklin’s game-winning TD catch. The Bruins weren’t perfect (Franklin’s fumble-itis reared its ugly head again, Aaron Hester, Dalton Hilliard and Jerry Johnson committed costly penalties, Center Jeff Baca missed two snap counts, and Ka’imi Fairbairn missed two more makable Field Goals), but they are still head and shoulders above where they were last year at this time. 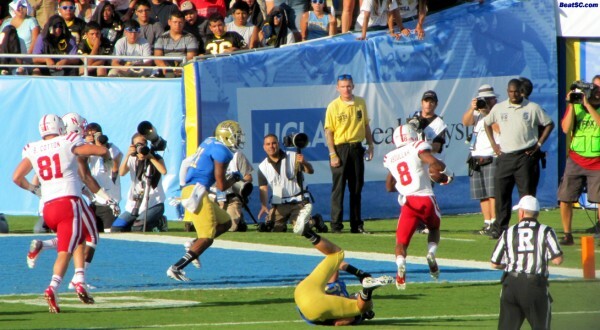 Visions of last year haunted Bruin fans for a few moments, when Hundley incurred a mild ankle sprain, and Richard Brehaut had to come in while the Bruins were in the Red Zone. Brehaut immediately wasted a Time Out, then failed to hit his Receivers in the End Zone, forcing the Bruins to settle for a Field Goal, ala 2011. I’m sure that every fan in the stadium believes that if Hundley were in, a Touchdown would have been the result of that drive. 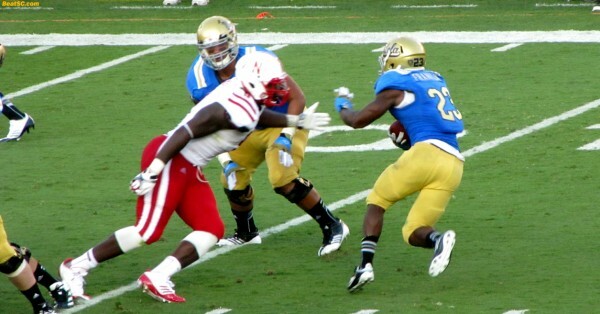 Hopefully, there will be no lingering effects of Hundley’s ankle injury, so that UCLA can continue their roll, and their ascension up the National Rankings, next week in the Rose Bowl against Houston. The Bruins and their fans suddenly have confidence, for the first time in YEARS, thanks to the new Coaching Staff, the new QB, and the new attitude that has swept through the whole team. 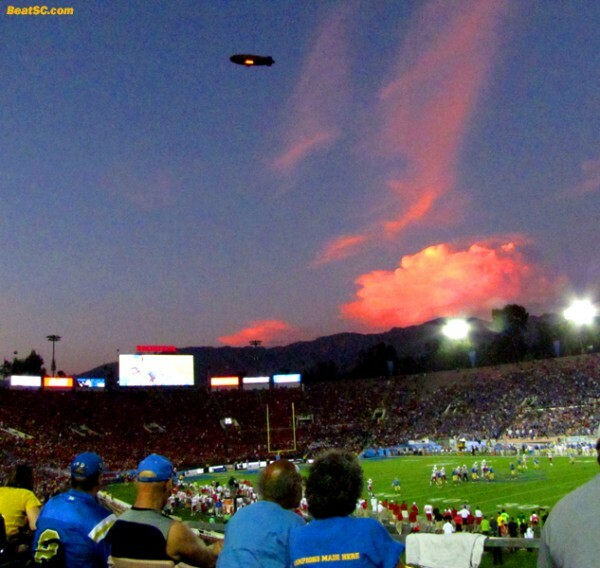 The swagger is back in Westwood/Pasadena… and it’s about time. Below are FIFTY game and CHEER photos from Saturday night. Click on them to ZOOM in, and check back soon for another 50+ pics, coming soon! The Bruin pass coverage still has room for improvement. Sheldon Price was absent (due to sickness, I believe), so some inexperience was exploited (even though the talent level may not have decreased). 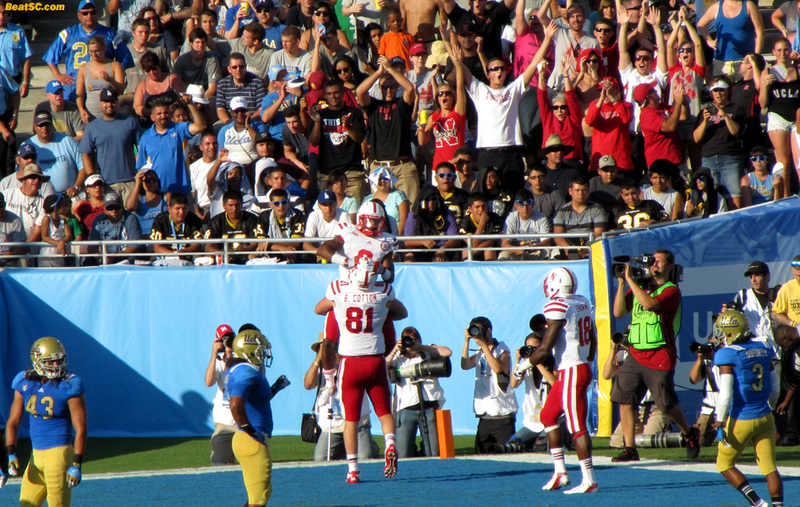 Here’s Cotton-pickin’ up Abdullah, celebrating that TD run. Hmmm. I BELIEVE that this is newcomer McKenna of the Cheer Squad, and I’m not sure, but is that Paula on the left in front of Maya? Oh my God — I feel like Chris Roberts!! Sorry, ladies. Note: Many more photos from this event coming soon, and yes, I know I owe you some DANA, KAYLEY, PAULA, AND KALI. Kali is on the Yell Team now, but I know I got some photos of her to share, and I know I have some good ones of Dana and Paula too. And I will search the 840+ photos, seeking some shots that do justice to newcomer Kayley. 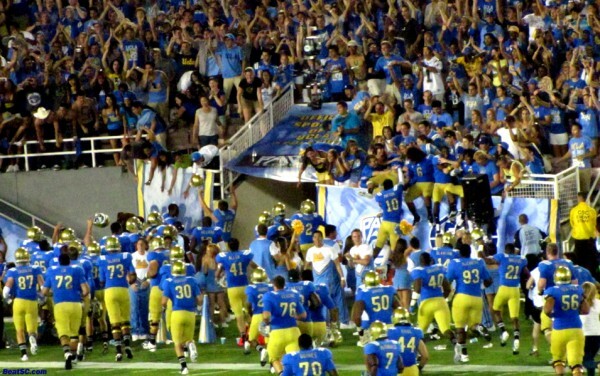 "Bruins Turn The CORN-er" was published on September 9th, 2012 and is listed in Blue & Gold News, UCLA/usc/Cheerleader Photos, UCLA/usc/Sports Photos. 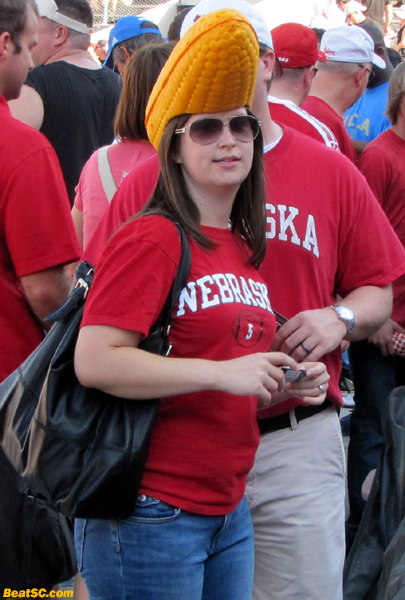 Let’s hope the Nebraska win is a sign of times to come. Nice to have all the Spirit Squad back. The newcomers on the Dance Team are strong and can carry on the reputation. Kate is definitely a Hall of Famer. Isn’t Dietrich Riley out for the year for medical redshirt due to his neck? T-H’a Note: Sorry, I meant Dalton Hilliard. Anyhoo, I am so impressed by this team, there is definitely something very special Bruin’ in Westwood. Was elated to wake up to a #22 National ranking this morning! I can’t remember the last time we broke the top-25. If #1 ranked Franklin keeps this up…he will quickly be in the Heisman talks. HOORAY!!! 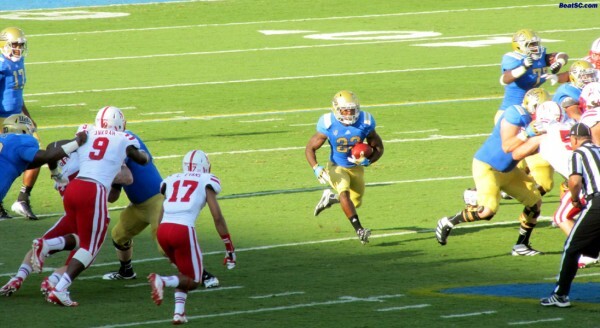 GO BRUINS!!!! KEEP IT UP!!!! Congrats on a very impressive win! 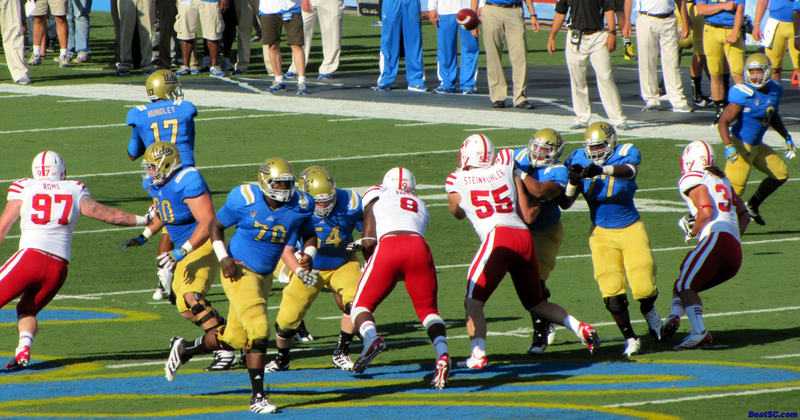 I’m usually pulling for a Big 10 win (except when Ohio $tate plays), but it was nice to see the Uclans back. Now the idiots at south central are paying attention.